SMG2000/3000 series E1/T1 VoIP gateway separates the signaling from the voice path, adopts high-speed data link to transmit the signaling message, featuring high transfer speed, shorter call setup time, large signal processing capacity, flexibility to change and expand, low investment on signaling equipment and high channel availability. SMG3000 solves the problem of high reliability and high real-time transmission effectively in IP network, and ensures the reliable transmission of the SCN signaling (mainly SS7) in IP network. SMG3000 has been used for a wide range of applications in the market worldwide, Its DSP-based architecture ensures the signaling is transmitted accurately and efficiently. With high reliability in operation, SMG3000 possesses unparalleled transmission efficiency, providing the reliable way to ensure the signaling to transmit in the correct order without losing and repeating. SMG3000 transmits business signaling or other forms of information that diverse users require transparence, high-reliability, and high-stability to meet the needs of several business networks. At the same time, because of low-cost network facility, low investment on signaling equipment, enterprises and individuals can benefit from it. Synway offers Signaling System 7 (SS7) software as part of its broad range of protocols, allowing users to directly connect switching, media processing and signaling platforms to a carrier’s network–via TDM-based signaling transport. Using Synway’s SMG2000/3000 series E1/T1 VoIP Gateways, the SS7 protocols are suitable for worldwide deployment, bringing together DSP-based functions and PSTN connectivity on a cost-effective single platform for both IP and TDM environments. SS7 is the protocol that defines the procedures to transport and process database queries necessary for providing today’s advanced intelligent network (AIN) features and services. SS7 is increasingly being used to bridge the PSTN with next-generation Internet Protocol (IP) and 3G Wireless networks, which enables seamless convergence and inter-working of PSTN and IP protocols within a unified architecture. The SS7 packets combine to bring tremendous value for service providers and enterprise solution providers alike. 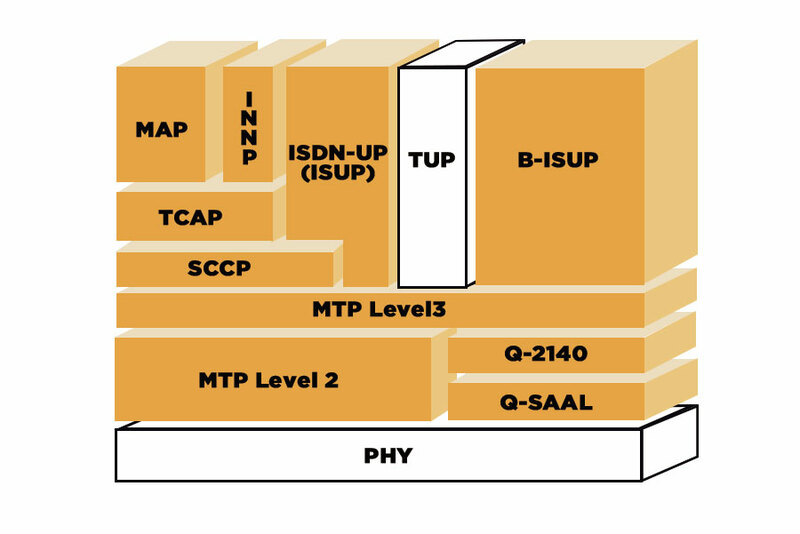 A complete array of packets, including MTP1~3, ISUP, TCAP, SCCP, MAP and more, empower mobile solution providers to efficiently and rapidly deliver most value-added service and applications. The SS7 standard has been extended for multiple country-specific variations, such as ANSI in America and ETSI standard in Europe. The Global System or 3G for Mobile Communications (GSM) is a globally accepted standard for digital cellular communications. Mobile Application Part (MAP) – GSM/3G supports interactive mobile applications (e.g., cellular, paging, voice messaging) between the network entities in a GSM/3G system. These functional entities include Home Location Registers (HLRs).